Note: This article will be updated as new information surfaces. Your hashtags don’t work? You are experiencing lower engagement than usual? 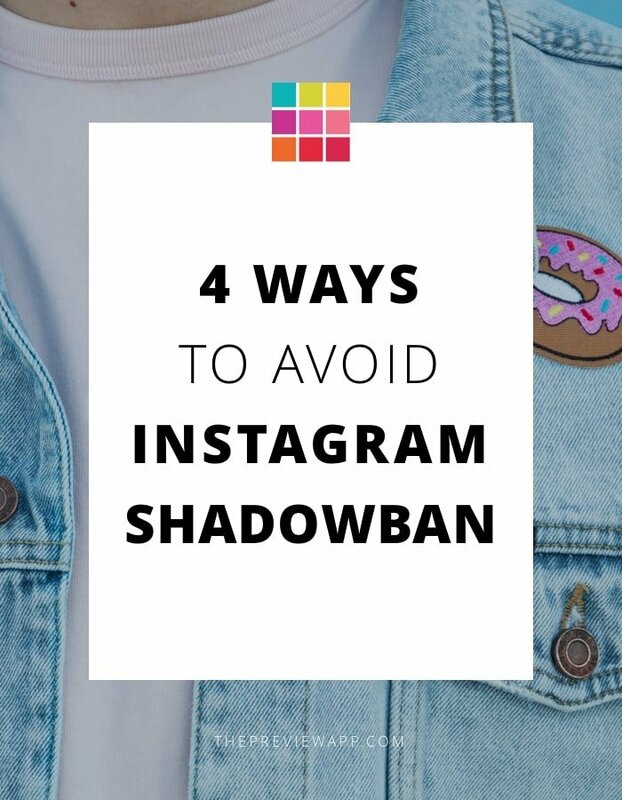 In this article I will explain exactly what you need to do to avoid an Instagram Shadowban. The reason the “hashtags are broken” will make more sense as you read this article. This article is important. It is for you to know exactly what Instagram allows and doesn’t allow us to do. Based on our research and what people have reported, the following things seem to be linked to the Instagram shadowban. I will explain each point in detail, why they are important to know, and what you can do about them. If you have already been banned, you can still follow these steps to get back in Instagram’s good books. “Instagram deleted my photos”, “My Account Disappeared”: What’s happening? Very quickly: what is an Instagram shadowban? Normally, when you get banned from Instagram, you receive a notice that your account has been reported. However with an Instagram shadowban, you don’t receive any notifications. You only see your engagement drop, and drop… and drop. Another clear indication that your account might have been shadowbanned is when your hashtags don’t work. Do not rely on the Instagram Shadowban Tester website. We have analyzed it from a technological perspective and can tell you that it is not 100% reliable. In fact, many people who used this test have reported that after checking manually, their account was in fact not shadowbanned. Instagram silently punishes accounts that are not playing fair… or those who might have got unlucky by simply… using the wrong hashtags… for example. Are you allowed to use bots, automated apps & websites? Short answer: No. They can get your account blocked or banned. Keep reading if you want to understand. Instagram has recently updated their algorithms and Terms of Service to a much tighter security against bots and automated tools. These tools are to be banned from your toolkit right now. Instagram clearly states in its Developer’s Policy (points 18 to 23) that no app or website should automatically like, comment, follow or post on your behalf. If you are using an automated tool, you might not think that it could hurt your account right now (and if you’re lucky, it might never). But Instagram has made it clear it does not like bots (back in 2014 if you remember). This year (2017) Instagram has made it even clearer. Just last week, Instagram shut down the most popular Instagram automated tool, called Instagress. Let us make this very clear: Instagram can recognize patterns (in the way you like, comment, follow & post). If your behavioral pattern on Instagram looks suspicious (like the one of a bot), you are putting your account in danger. Note: this is the case for apps & websites that use a different or the same IP address as you (read in the comments section for more explanation on this). So don’t be fooled. One other thing to remember is that bots artificially drive up engagement and make accounts appear more popular and valuable. You have to think long-term. More followers doesn’t necessarily means higher sales. It’s artificial engagement. Do you want your business to be associated with a bot tool when major news, like the Instagress shutdown hits, and your engagement plummets? Instagram rolled out its Business Profile features. It wants you to pay THEM to get more engagement – not some third party app. To find out more which apps and websites to avoid, check this article by Alex Tooby. Keep reading. Below, I will also show you how to instantly spot any app or website to avoid. Do not use these sort of apps and websites. Interact with other Instagrammers like a normal person (not a robot). That’s what Instagram wants you to do. And in turn, you will be rewarded by Instagram in the long run. Not only that, but you’ll grow strong relationships with your followers. If you are using an Instagram scheduling app, make sure you are receiving a notification when it is time to post (the app should not automatically post for you). Following on from my previous point, I want you to be able to spot unapproved apps or websites. Not all of them are bad (Preview App is safe, don’t worry). If an app or website has not been approved by Instagram, it can get your account shadowbanned or temporarily blocked (I am sure you have heard of this happen before). 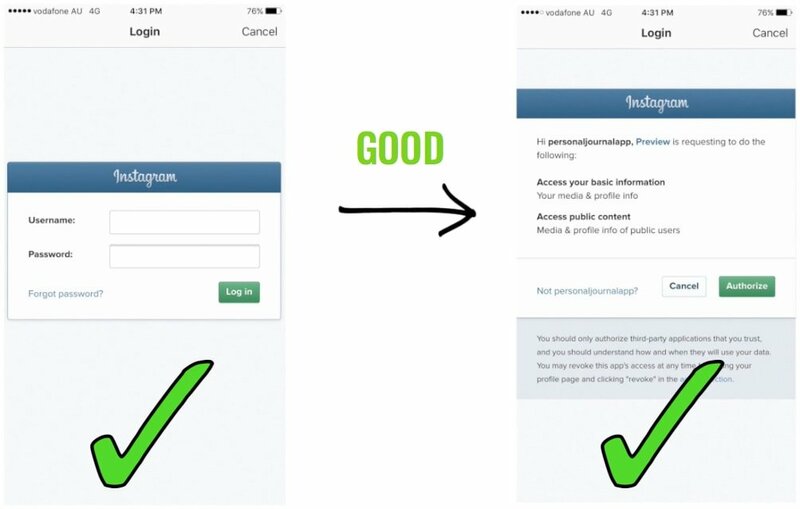 There are 3 ways to tell if an app or website has been or has not been approved by Instagram. The login form should look like the one below. And you should be asked to give permission. Second, if you are signing up to a tool on a browser, and you have to login to your Instagram account, the URL must include “instagram.com”. In short, when you are asked to login to your account, the login screen should redirect you to the Instagram.com URL. This is a compulsory step to keep your account safe. If you decide to sign up to an Instagram scheduling tool and you read “no phone required” and /or “automatic posting“, that is a bad sign. If you don’t need to physically like, comment & follow, it’s bad. The tool is breaching Instagram’s Policy. If any of the above criteria is missing your account is in trouble. The service provider (app or website) you’re using does not follow Instagram’s Terms and Conditions and can also access your Instagram username and password. This is a high security risk. And if you are using any of these tools, please change your Instagram password right now. Instagram’s algorithm is smart. Don’t play with fire. It will record your account and (eventually) punish you. Always look out for these 3 criteria. If you have used any unapproved tools, change your Instagram password right now to avoid more damage. Hashtags won’t work anymore because Instagram might have detected something suspicious with your account (yep, even if you’re not using a bot – and yep, it’s not fair). So they stop you from getting organic traffic. It doesn’t matter if you’re using hashtags (they won’t work anymore). Hashtags won’t work because some hashtags you’ve used recently (or in the past) could have been blocked or banned by Instagram. Click here for the full list of banned or blocked hashtags (Warning: Some of these words may be offensive to readers). There is also a number of other things to take into consideration when using hashtags, which I’ve listed below. Research a hashtag before you use it to make sure it is not inappropriate or already blocked (it won’t show in the hashtag search results if it is blocked). Keep your hashtag sets fresh. Do not use the same hashtag sets over and over again on every single post (it might look spammy to Instagram). Avoid using too many high density hashtags (too competitive and sometimes very spammy). Even if we are not using any of the above unapproved tools and hashtags, we are still at risk. Avoid editing your captions after you’ve posted a photo. Put your hashtags in the caption, not in the comments anymore. Don’t go on a mass likes, follows and comments spree or you will signal a red flag to Instagram’s algorithm, because you act like an automated application. As a rule of thumb, avoid going over 200 likes, 60 comments and 60 follows/unfollows per hour. If you’ve planned to, don’t switch from a personal account to a business account. Don’t post too many posts per day (keep it at 3 or less). If you received an email from “Instagram” to reset your password, be careful. Someone might try to hack your account. Ignore or report immediately to Instagram. Are you victim of Instagram shadowban? If you have been a victim of a ban, share with everyone in the comments what happened to you and how you think it might have happened. Has the ban been lifted? How did you do it? Please help each other out if you know any more information. We will keep you updated here and through our Instagram feed (@preview.app).